I have to say that I absolutely love children's books that use real photographs in them and when they form the basis of the book, you get a beautiful creation like Curious Critters. This book is fabulous! Every photo jumps off the page at you and captured my attention and both Liam and Erik's too! While Erik is a little young to grasp the linkages and information, he was entranced by the photography and images. Liam enjoyed having everything read to him and then identifying the parts of each creature as well as finding out more about each animal. My favorite page was the jabbering blue jay, and you could see every feather and the twinkle in his eye in the photo! If you are a parent, grandparent, teacher or just a nature lover who likes kids - you need to add this book to your collection - it will bring you hours of joy! David FitzSimmons is a freelance photographer and writer as well as a university professor. He photographs and writes for various magazines, including Outdoor Photographer, PopularPhotography, and Shutterbug, newspapers, and online publications, and his over-100 calendar credits include numerous titles by BrownTrout and Barnes & Noble. 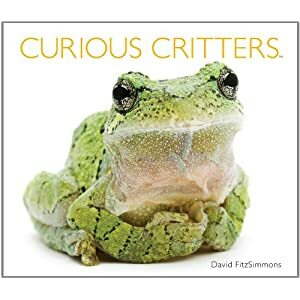 Curious Critters is David's first children's picture book. A former high school English teacher, David has been in education for twenty years. He is a professor at Ashland University, Ashland, Ohio. David holds a Ph.D. in English from Ohio State University, with a specialty in narrative theory-investigating the components of storytelling-something that influences his photography and writing. David was inspired to photograph and write about nature by his parents, Mick and Judy FitzSimmons, active environmentalists and life-long teachers, and he is assisted in his natural history endeavors by his wife, Olivia, a naturalist, and his two daughters, Sarah and Phoebe. One of five Sigma Pro photographers in North America, David presents seminars and workshops to a wide variety of audiences, from public school groups and college classes to nature centers and civic organizations. His works have been exhibited at the Roger Tory Peterson Institute, the National Center for Nature Photography, and the Telluride Photo Festival, among other venues. David's environmentally focused, multi-media performance, "350: Images of Fragile Earth," travels widely.